A method to intranasally administer drugs to awake mice for the purpose of targeting the brain is described. This method allows for repeat dosing over long periods using intranasal administration of drug without anesthesia, and nose-to-brain delivery with minimal systemic exposure. Hanson, L. R., Fine, J. M., Svitak, A. L., Faltesek, K. A. Intranasal Administration of CNS Therapeutics to Awake Mice. J. Vis. Exp. (74), e4440, doi:10.3791/4440 (2013). Intranasal administration is a method of delivering therapeutic agents to the central nervous system (CNS). It is non-invasive and allows large molecules that do not cross the blood-brain barrier access to the CNS. Drugs are directly targeted to the CNS with intranasal delivery, reducing systemic exposure and thus unwanted systemic side effects1. Delivery from the nose to the CNS occurs within minutes along both the olfactory and trigeminal neural pathways via an extracellular route and does not require drug to bind to any receptor or axonal transport2. Intranasal delivery is a widely publicized method and is currently being used in human clinical trials3. The intranasal grip for mice can be learned, but is not easy and requires practice, skill, and a precise grip to effectively deliver drug to the brain and avoid drainage to the lung and stomach. 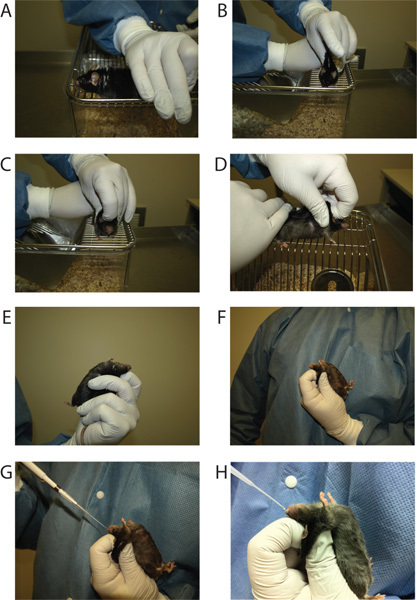 Mice are restrained by hand using a modified scruff in the non-dominant hand with the neck held parallel to the floor, while drug is delivered with a pipettor using the dominant hand. It usually takes 3-4 weeks of acclimating to handling before mice can be held with this grip without a stress response. We have prepared this JoVE video to make this intranasal delivery technique more accessible. Mice must be acclimated to handling for a period of two-four weeks before the onset of intranasal dosing. Acclimation to handling is important, as it helps ensure a correct body position for maximum effectiveness of awake intranasal drug delivery. In addition, mice that have not been properly accustomed to this process can have a severe anxiety reaction after dosing. Mice should spend about 2-3 days on each of nine steps before progressing to the next step, depending upon the animal's comfort to handling. The mouse's stress level should be used as a measure of progress. This means monitoring the mouse's movements, the amount/frequency of urination, defecation, trembling, and biting. If a mouse has a high stress response, stay on that step before progressing to the next until the response is reduced. A sample acclimation schedule can be seen in Table 1. Acclimation of the mice should progress through the following once-a-day steps. Performing these steps more than once per day, in an attempt to accelerate the acclimation, is not recommended. Place the mouse in the palm of the hand for a period of two to three minutes, no more than one foot above the cage top, as animals frequently jump during this introductory step. If the mouse attempts to crawl out of the hand and up one's arm, simply lift the mouse by the base of the tail and place it back in one's hand. Place the mouse in the palm of the hand for three minutes and pet the animal gently. Pet the mouse directionally from the head to the tail, while allowing the animal to move about freely. Place the mouse in the palm of the hand for three minutes while massaging behind the ears (lightly pinching together the skin on the back of the neck using the thumb and pointer finger). Hold/lift the mouse by the scruff of its neck for 30 sec, letting the mouse rest on the cage top for 30 sec before repeating the hold again. Hold the mouse using the intranasal grip, which is described in section 2, but do not invert the animal (complete up to step 2.4). Hold the animal like this for a period of 30 sec and release back to the cage top. Repeat a second time after a one-minute rest period. Hold the mouse with the intranasal grip as described in section 2, including inverting the animal so its ventral side is facing up towards the ceiling. Make sure that the animal's neck is parallel to the floor. Hold this position for 30 sec. Repeat this a second time after a one-minute rest period. Some mice will resist the intranasal grip more than others, especially when used for the first time with inversion at this step in the acclimation. If the mouse frees itself from the grip, put the mouse back on the cage top and re-grip. Repeat the re-grip if needed, but monitor the stress level of the mouse and return it to the cage if necessary. Another factor that can play a role in losing the grip at this point in the acclimation process is inexperience of the animal handlers with the intranasal delivery technique. Hold the mouse with the intranasal grip, invert, briefly place a pipettor with an empty tip over each nostril, and hold the animals position for 30 sec. Repeat this after a one-minute rest period. Hold the mouse with the intranasal grip, invert it, and intranasally administer 6 μl of saline into the left and right nare as described in section 3 (through step 3.7). Hold the mouse with the intranasal grip, invert it, and intranasally administer 6 μl of saline into the left and right nare twice placing the animal back on the cage top in between, as described in section 3. Place the mouse on the cage top. With the thumb and index finger of your dominant hand, hold the mouse by the tail. Using your middle, ring, and pinky fingers, lightly pin the lower portion of the body to the cage top (Figure 1A). Let the mouse grab onto the bars as you lightly stretch the mouse out and better grab the scruff. Using the thumb and middle finger on your non-dominant hand, pinch the mouse firmly at the scruff (excess skin) behind the neck and shoulders. Pull up on the loose skin to make a tent of skin across the shoulder blades (Figure 1B). Take as much skin as possible, but be careful not to pull up muscle as this will cause discomfort to the mouse. Exercise caution so as not to apply too much pressure to the animal's ribcage or spine. Excessive pressure or pulling of the skin may lead to inhibition of respiration in some cases. Quickly place the index finger of your non-dominant hand on the mouse's head as close to the nose as possible and pull back on the skin (Figure 1C, 1D). At the same time, slide the thumb and middle fingers toward the head for optimal position. Ideally, the mouse should not be able to move its head vertically or horizontally. While maintaining the grip on the scruff, turn the mouse onto his back. The mouse's back should be in the palm of your hand. Firmly hold the mouse's tail (near the base) against your palm with your last two fingers (ring and pinky) to stabilize the mouse, or you may wrap your fingers across the lower body (Figure 1E, 1F). At this point make sure that the mouse's neck and chin are flat and parallel to the floor. The chin should be close to a 180 degree angle with the neck as much as possible to assist with intranasal delivery. Slight changes in angle can cause the drug to end up in the wrong site. Make sure the mouse is able to breathe by watching the abdomen. The mouse should not be able to move, but should be comfortable and not in any pain. If you see the mouse's neck and chin making a "V", then you need to re-grip. Using the intranasal grip, each mouse is restrained twice and held with their neck parallel to the floor while a volume of 20-30 μl of liquid is administered. This volume is safe and efficacious for small-large mice; we typically use 24 μl, and that is described in this protocol. The awake intranasal method can be used in mice of any age, for example in newborn mice for developmental neuroscience research. In newborn mice, a smaller total volume (8 μl) and droplet size (1 μl) should be used to accommodate the smaller volume of the nasal cavity. Drug is typically delivered to two mice at a time, alternating rest periods to make the most efficient use of time and keep on schedule. Set-up will be a little different depending on if you are dosing group housed mice or individually housed mice. With the individually housed mice, it is helpful to place all of your materials in between the cages to prevent mice from crossing over to the other cage top. With the group-housed mice, dose from that cage only. It is important that each mouse in a group-housed cage receives the same intranasal treatment, as potential for cross contamination of two different treatments exists due to drug expelling into the air or with skin contact. It is highly recommended that a dosing sheet be printed in advance, to remind technicians of treatment assignments, to record any notes of missed drops, to note general health of each animal, etc. Set up cages where they should be for dosing, and set up a dosing station (Figure 2). Remove mouse from cage and keep on cage top during dosing. Pick up the mouse using the intranasal grip described in section 2. Using your dominant hand, load the pipettor with 6 μl of drug or vehicle. Place the tip of the filled pipettor near the mouse's left nostril, usually at a 45 degree angle (Figure 1G, 1H). If you have a viscous solution you may need to increase your angle to 90 degrees because the drug may run up the side of the pipette tip instead of making a drop. If very viscous, wiping the pipette tip with a tissue before expelling liquid may help. Slowly eject the drug to form a small droplet with about half of the volume (3 μl). The droplet should be placed close enough to the mouse's nostril so that the mouse can inhale the droplet. Immediately after the mouse inhales this small drop, eject the rest of the drug in the pipette tip to form another small droplet for the mouse to inhale through the same nostril about 2-3 sec later. Be sure to watch the mouth. If there is any liquid in the mouth, the drop did not make it fully into the nose and this should be noted. Hold the mouse in this position for 15 sec. It is highly recommended that a timer be used to standardize this 15 sec hold. Repeat steps 3.3 - 3.6 for the right nostril. If any drops are snorted out, that drop should be replaced and noted. Place the mouse back on top of his cage for 2 min. Repeat the entire process starting 2 min. after delivery of the first drop. This gives the mouse four drops of 6 μl each totaling 24 μl of solution. A sample schedule for dosing one or two mice at once can be seen in Table 2. After the mouse has received all drops, return the mouse to its cage. After each acclimation or intranasal dosing session, mice should be given a treat, such as a Cheerio or peeled sunflower seed as positive reinforcement. Treats are given as a reward and to distract them from scratching their noses, potentially causing injury to themselves. When working with group housed mice, enough treats should be dropped for each mouse. Before returning animals to their cages be sure to restore nests to their original states in order to reduce stress. When dosing group housed animals, gloves must be changed between dosing of cages so as not to transfer scent from cage colony to cage colony, as they will become aggressive towards one another. There are several ways to determine the efficacy of drug delivery. The first is to intranasally administer a dye, such as India ink or methylene blue and to visualize the dye after euthanasia of the animal within the olfactory epithelium and after the brain is removed, entering the CNS through the cribriform plate. The second is to measure the drug delivered either by using a radio-labeled tag or using ELISA detection of the unlabeled molecule. A good example of drug distribution in the CNS after administration to awake mice can be found in Hanson et al. 20127. We expect the olfactory bulb and trigeminal nerve to contain a high concentration of the drug delivered. At 30 min after intranasal administration of 3.65 μmol deferoxamine, concentrations in the trigeminal nerve and olfactory nerve were 29 μM and 13 μM respectively. Drug concentrations will be evident throughout all regions of the brain (in this example a range of 0.6 μM to 4.1 μM was measured) with higher concentrations in areas receiving input from the olfactory and trigeminal nerves. For example, rostral regions of the cortex will contain higher concentrations than caudal cortex and the pons will contain higher concentrations than the midbrain or medulla. In the spinal cord a descending concentration gradient from cervical to lumbar spine is generally observed (in this example a gradient of 1.5 μM to 2.0 μM). Intranasal administration also results in high concentrations of drug reaching the meninges and cervical lymph nodes. The third way to demonstrate efficacy of delivery is to measure a behavioral or biochemical response to the drug administered. For example, intranasal deferoxamine treatment of transgenic Alzheimer's mice resulted in improved performance in a spatial memory task7 and phosphorylation of glycogen synthase kinase 3 beta9. Table 1. Sample Schedule for Acclimation to Handling for Intranasal Dosing to Awake Mice. *The pipettor is loaded once with 6 μl, but administered to the mouse as 2 x 3 μl drops. Table 2. Sample Timeline for Dosing One or Two Mice. Figure 1. Photos of different stages and angles of holding a mouse for awake intranasal delivery of drug. 1A) Hold the mouse down firmly on the cage top with the dominant hand leaving the shoulders exposed to grip the skin. 1B) Use the thumb and middle finger of the non-dominant hand to grip and pull up skin just behind the shoulder blades. 1C) Use the index finger to pull skin back from between the eyes towards the thumb and middle finger (front view). 1D) Same as 1C (side view). 1E) Hold the mouse upside down using the ring finger and/or pinky to secure the base of the tail to the palm of the hand. The neck of mouse should be horizontal. 1F) Same as E, from other side. 1G) Administer drug with a 20 μl pipettor and gel loading pipette tip. 1H) Same as 1G, close-up view. Figure 2. A photo of a complete dosing station for 2 individually housed mice. 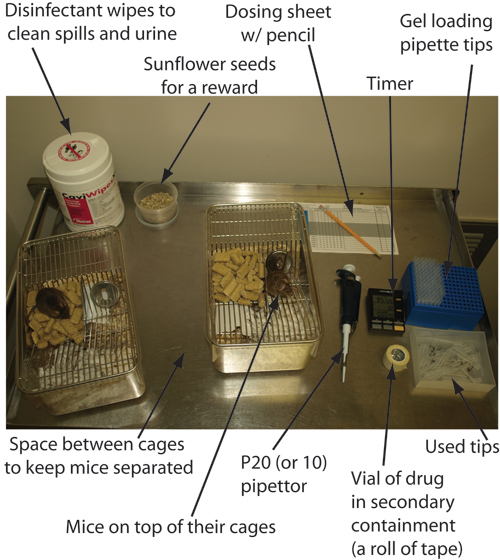 Included are the two mouse cages with enough distance between to keep the mice separate, a pipettor with tips, a container for used tips, a timer, dosing sheet, a post-dosing treat (like sunflower seeds or cheerios), sanitary wipes, a P20 (or P10) pipettor, and the drug to be delivered. This method shows how mice can be given regular doses of intranasal drug to target the brain without the use of anesthesia. Intranasal drug can be delivered to large groups of mice for extended periods of time with minimal effort. A single group of up to 20 mice can be intranasally treated by a single person in less than one hour. A vast array of molecules, ranging from small iron chelators to growth factors to mesenchymal stem cells, have been demonstrated to rapidly target the CNS and have shown efficacy in rodents models. Proposed mechanisms of direct delivery from the nose to the brain include extracellular transport along the olfactory and trigeminal nerves and bulk flow within the perivascular spaces1,10. Intranasal delivery to the CNS is an especially useful technique because not only is it rapid, but it targets the CNS reducing systemic exposure. For example, intranasal administration of deferoxamine to rats resulted in 3-19 times higher concentrations in brain regions with 28 times lower concentrations in the blood11. In another example, intranasally administered insulin improves memory in Alzheimer's patients within 15 min without changing the plasma levels of insulin or glucose12. An additional advantage is the non-invasiveness of the intranasal delivery technique. There are several limitations to this method. First, drug delivery is limited to about 20-30 μl in a single administration, so solubility of the therapeutic will play a role in determining the dose limits. Also, the drug formulation is important as factors like pH and salinity can affect the delivery. Large deviations from natural conditions, such as extreme pH and salinity, can damage the respiratory and olfactory epithelia of mice.13,14 Further, intranasal dosing of unanesthetized mice can be difficult to master, and can take several weeks of training for intranasal "dosers" to be able to minimize "head-wiggle room" and achieve optimal intranasal dosing of drug. With incorrect dosing technique, the drug can drain into the lung or the stomach, which can introduce variability in drug reaching the brain. Signs that this has occurred are breathing difficulties or visualization of liquid in the mouth after administration. If possible, it is advisable to limit new intranasal "dosers" to delivering saline/vehicle to control groups for several weeks or months before they are approved to dose drug by expert trainers. Finally, this awake intranasal method is limited to mice, as awake rats and larger animals are not as easily gripped, and can be overly stressed when held upside down. The authors would like to thank the HealthPartners Institutional Animal Care and Use Committee at Regions Hospital. Dhuria, S. V., Hanson, L. R., Frey, W. H. 2nd Intranasal delivery to the central nervous system: mechanisms and experimental considerations. J. Pharm Sci. 99, 1654-1673 (2010). Thorne, R. G., Pronk, G. J., Padmanabhan, V., Frey, W. H. 2nd Delivery of insulin-like growth factor-I to the rat brain and spinal cord along olfactory and trigeminal pathways following intranasal administration. Neuroscience. 127-481 (2004). Benedict, C., et al. Intranasal insulin as a therapeutic option in the treatment of cognitive impairments. Exp. Gerontol. 46, 112-115 (2011). Francis, G. J., et al. Intranasal insulin prevents cognitive decline, cerebral atrophy and white matter changes in murine type I diabetic encephalopathy. Brain. 131, 3311-3334 (2008). Francis, G., et al. Intranasal insulin ameliorates experimental diabetic neuropathy. Diabetes. 58, 934-945 (2009). Marks, D. R., Tucker, K., Cavallin, M. A., Mast, T. G., Fadool, D. A. Awake intranasal insulin delivery modifies protein complexes and alters memory, anxiety, and olfactory behaviors. J. Neurosci. 29, 6734-6751 (2009). Hanson, L., et al. Intranasal delivery of deferoxamine reduces spatial memory loss in APP/PS1 mice. Drug Delivery and Translational Research. 2, 160-168 (2012). Danielyan, L., et al. Protective effects of intranasal losartan in the APP/PS1 transgenic mouse model of Alzheimer disease. Rejuvenation Research. 13, 195-201 (2010). Fine, J. M., et al. Intranasal deferoxamine improves performance in radial arm water maze, stabilizes HIF-1alpha, and phosphorylates GSK3beta in P301L tau transgenic mice. Exp. Brain Res. 219, 381-390 (2012). Lochhead, J. J., Thorne, R. G. Intranasal delivery of biologics to the central nervous system. Adv. Drug Deliv. Rev. 64, (11), 614-628 (2012). Hanson, L. R., et al. Intranasal deferoxamine provides increased brain exposure and significant protection in rat ischemic stroke. J. Pharmacol. Exp Ther. 330, 679-686 (2009). Reger, M. A., et al. Effects of intranasal insulin on cognition in memory-impaired older adults: modulation by APOE genotype. Neurobiol. Aging. 27, 451-458 (2006). Kim, C. H., Song, H. yun, M, E. unA. hn, Lee, Y., G, J., Yoon, J. H. Effect of hypo-, iso- and hypertonic saline irrigation on secretory mucins and morphology of cultured human nasal epithelial cells. Acta Otolaryngol. 125, 1296-1300 (2005). Greiff, L., Andersson, M., Wollmer, P., Persson, C. G. Hypertonic saline increases secretory and exudative responsiveness of human nasal airway in vivo. Eur. Respir. J. 21, 308-312 (2003).